General Iroh has three badges with tassels on them below his left chest pocket. The first badge is a blue square, the second is a green diamond, and the third is a magenta rectangle. These are little details that one might not notice watching the The Legend of Korra, but for someone like me, they are some of many aspects that make this uniform so cool. Having only seen these kinds of emblems, it was fun figuring out how to make these little badges. I wanted to expand on the process in case anyone is interested in making General Iroh’s badges or something similar. Begin by portioning out an amount of clay appropriate for the size badge you want. The clay will be a bit hard to start. Work the clay until it becomes softer. Before setting the clay down, get a piece of parchment paper and lay it on your flat working surface. Then place the clay between two popsicle sticks on top of the parchment paper. Sit the rolling pin one end of the popsicle sticks. Roll the pin back and forth. The clay in this manner should become completely flat and become the thickness of the popsicle stick. Once you have your flattened piece of clay, lightly use your craft knife to cut the clay to the desired shape—or in Iroh’s case a square, diamond, and rectangle. Be careful not to cut completely through the parchment paper. Place the flattened piece of clay on a baking tray and bake according to the specifications on the label. 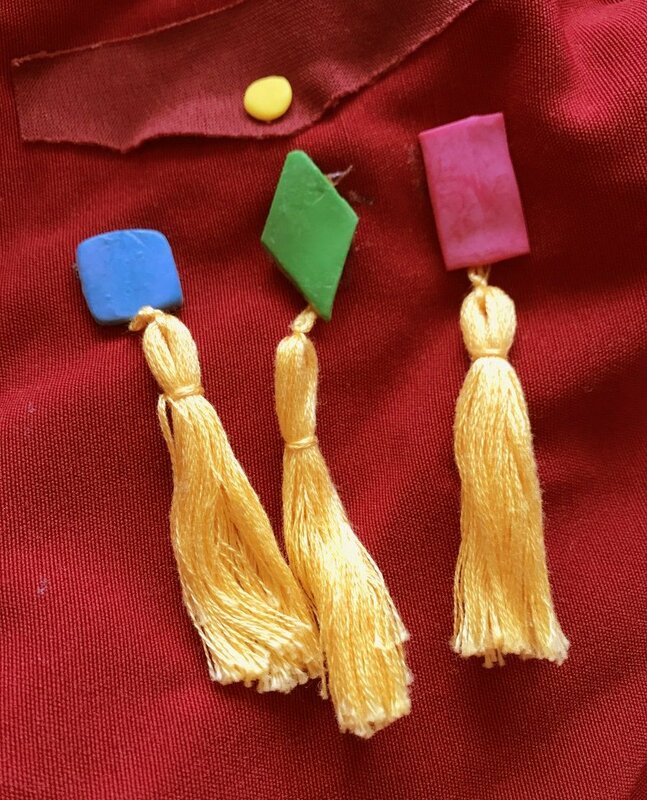 For the tassel, get your piece of cardboard and, lining up the edge of the embroidery floss with the edge of the cardboard, begin wrapping the string around the length of the it. Be sure to hold the end of the floss until the end no longer moves as a result of wrapping. The more you wrap the embroidery floss around the cardboard, the more lush the tassel will look—lush tassels, is that even a thing? When you’re done wrapping, hold the top part of the strings where it goes up and comes down. Get your scissor and cut the bottom end so that you have a lot of loose ends. Get another piece of embroidery floss and place it where your finger is so that it can scoop up all of the string pieces. This will be the string that dangles between the badge and tassel. Tie this top piece of floss to secure it. Lastly, bunch the strings together and wrap another piece of embroidery floss around this bunch. Tie this piece of floss at whatever length you want from the top of the tassel. I made my knots about half an inch from the top. The ends of the string that you just tied can be left hanging or you can hide them by placing them on the backside of the tassel. When your clay pieces are ready and cooled, you can use most kinds of tape or glue to attach the pieces together. For washability, you can attach a clip to the back and make them detachable.